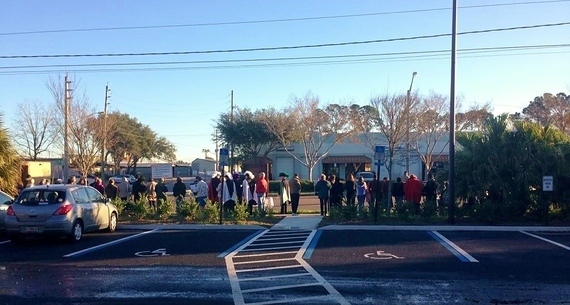 Protesters lined outside our health center. Picture by Javan Frinks. Full disclosure: While I am a Planned Parenthood employee, the views of this post are my own. When I attained a position with Planned Parenthood almost two years ago, I was ecstatic. I would finally make a living doing something I truly believed in. As is normal, my first day was reserved for training. As is also normal, I received my name badge, but what wasn't normal was the warning that followed: My supervisor explained to me that I should always take the name badge off when I left the building. I asked her why, and she explained that a different employee had worn her own name badge into a grocery store and a man had approached her. He proceeded to tell her that he was going to bomb her house because of where she worked at. She was a short woman, with two children, and a husband who was in the military. She decided working for Planned Parenthood was too much of a risk, and quit. This image, the image of a man telling a woman that he would bomb her house, is in stark contrast with the image that McCullen v. Coakley is trying to paint. McCullen v. Coakley is the case that is now in front of the Supreme Court in hopes of striking down the buffer zone laws that create a safe space around abortion clinics, in which patients and employees can not be approached by protesters. In McCullen, the plaintiff Eleanor McCullen describes herself as "plump." She is short, at 5 feet 1 inch, and is 77 years old. They insist that she's hardly a threat to anyone she may want to approach, in hopes of dissuading them of getting an abortion. They try to make it sound as if all protesters are and look like her. But that's not what we see and experience, week after week, in front of our health center. The best protesters are similar to how they're portraying McCullen to be. Maybe not in age and physical appearance, but in the fact that all they do is pray and try to calmly talk to our patients. I may not agree with their views, but they do have a right to peacefully express themselves. The problem is that a lot of protesters are not like that. A lot of other protesters are loud, obnoxious, and mean. The worst one was a bearded man who stood well over 6 feet tall, and looked like he weighed about 250 pounds. He'd yell at our patients, his booming voice insisting that the patients didn't know what they were doing. That they didn't know what went on inside our health center. That one day they would regret their decision. He no longer protests outside our health center but the other protesters, while they may not look as intimidating, yell the same type of things, or worse. They talk about race and how we're supposedly targeting minorities. They even yell at the children of the patients. Sometimes they even take pictures and video of anyone entering and leaving the clinic and of the cars in the parking lot. The police have had to be called numerous times, and for various reasons. Most of our patients simply come in for birth control or gynecological services. They walk in feeling harried, complaining about what they've just been told by the protesters. We definitely don't get the worst of it. The buffer zone that began McCullen v. Coakley was enacted in 1994 after a man went into a shooting rampage in front of a Boston clinic. In other clinics patients and staff get physically harassed, their cars blocked, physical altercations happen, bomb threats occur that are aimed directly at the clinic. It is an ongoing problem that cannot be ignored, and for which the buffer zones exist. Statistics support these experiences, and showcases what it's really like outside of abortion clinics. Since 1977 there have been eight murders of abortion providers, and 17 attempted murders. That's on top of the 426 death threats, four kidnappings, and 530 cases of stalking. There have also been 42 bombings and 181 arsons. And that's on top of the other 99 attempted bombing/arsons in that same time, and 657 bomb threats. In a little more than three decades, there have been over 6,550 reported violent acts, and a total of 33,838 arrests. The buffer zone was created for a reason, and that reason hasn't gone away. Because of these statistics, because of what we see, and what we experience, and the fear that we sometimes have to live with, I see some of these protesters closer to terrorists (which the FBI does as well) than to plump lil' old grandmas. They claim to be pro-life, and yet have no regard for the life of the women who go into the health centers, or of the employees of said health centers, or their families. Because of these statistics, and because of what we see and experience and the fear we have to live with, I know buffer zones are absolutely necessary. It is not something that should be questioned, but something that should be embraced and enforced nationwide.